This bracelet comes with everything shown. This bracelet is shown with pink Cat's Eye beads, 14k gold-filled beads, gold-plated heart and ribbon charms and lobster claw clasp. 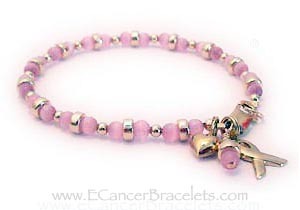 You can choose from several Cat's Eye Bead colors, pink is shown. I can customize this bracelet or any of my bracelets or necklaces on my website. Feel free to contact me with questions or to place a special order.